Perfect for a quick long weekend getaway or even a staycation, these four LA area hotels have caught our eye again thanks to the new cooks in the kitchen and updated menus. 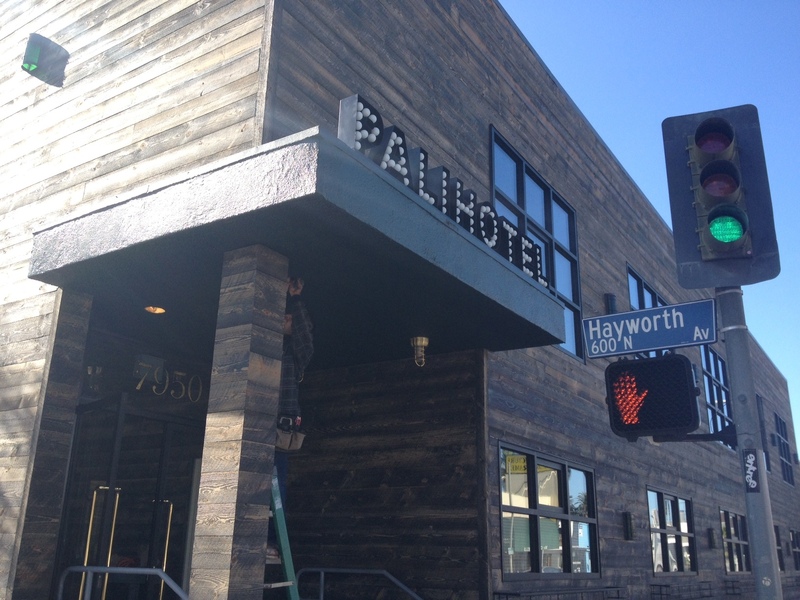 From sibling hotel the Palihouse in West Hollywood, this property might appear to be the shyer, younger sister of the boho-chic, long-stay hotel brand founded by Avi Brosh, but this trendy Melrose and Fairfax adjacent kitchen has finally come into its own. There were a few false starts with British Chef Brendan Collins (who is also the Executive Chef at Palihouse), but Chefs Brian Dunsmoor and Kris Tominaga – last scene at the wildly popular ‘Wolf in Sheep’s Clothing pop-up in Venice, are making exciting southern and regional American comfort foods with a twist. Chicken cracklin’ is self-explanatory fried skin that is insanely addictive and doesn’t even need the splash of hot sauce; the trout spread on a crostini type of bread with avocado could fit in with a high tea at an upper crust hotel. The low country shrimp boil and black eyed-peas are a standout but be sure to save room for the best cheddar biscuits this side of the Mississippi. Located in the heart of Third Street’s trendy shops and restaurants, Chef Bruce Kalman hails from the Lettuce Entertain you group and joins The Churchill team after opening The Misfits in Santa Monica. Kalman makes wonderful charcuterie in-house, 10-hour beef short ribs and beef cheeks but the true creativity comes out in the Farm House pizza with seasonal produce, local cheese, topped with an egg, or the duck fat popcorn – which we want to find in our local cinema next time. Mixologist Queen Mia Sarazen makes one of the best Pisco Sours in town, so pull up a bar stool in the lounge if you don’t have time for dinner. This new seaside, economically priced hotel along Ocean Avenue in Santa Monica – a stone’s throw from the new mall and promenade, was the perfect spot for the third outpost from the folks behind Blue Plate on Montana and Blue Plate Oysterette down the street. The tiny bar and main room is just steps from the hotel pool where you can order guacamole and blended margaritas or the house Chardonnay from Valle de Guadalupe in Baja. Menu musts are the ceviche or kale salad with goat cheese, mushrooms and corn, but the stuffed lobster or brisket tacos should not be overlooked, though you will be torn from the extensive list including chicken, shrimp carnitas, veggie and the daily seafood specials. 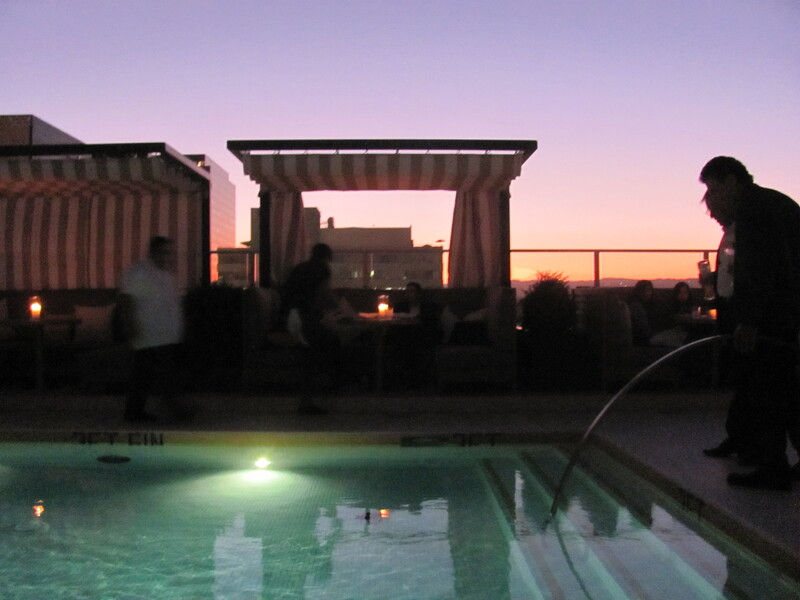 Boisterous Chef Eric Greenspan of The Foundry on Melrose seems right at home at this poolside, rooftop eatery in this Wilshire corridor hotel near LACMA. While the chef has been in-house since the opening, and is already well-known around town for his gourmet grilled cheese sandwiches, he whips up more refined comfort fare with sashimi flatbreads, tuna tartare nachos or mushroom risotto that are perfect for sunset cocktails or a late night bite. Perhaps his most ingenious dish is the breakfast pancake lasagna which will not leave you much room for lunch, but you really won’t care.